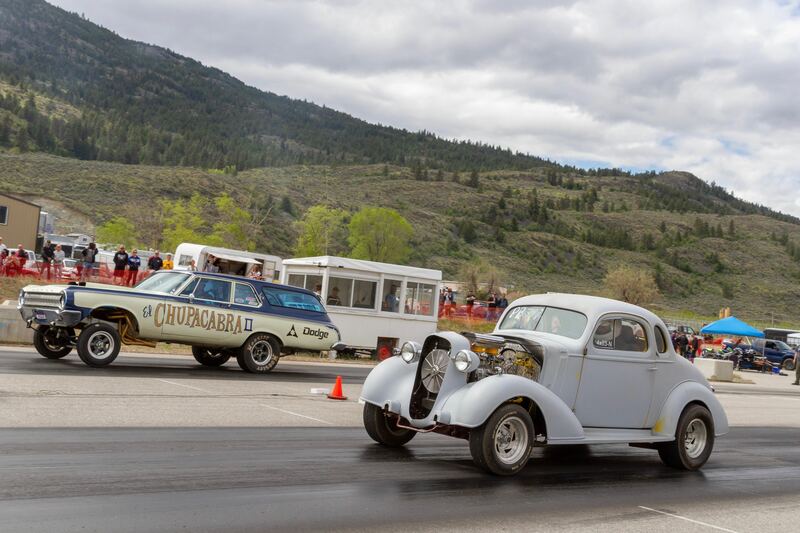 The ever-popular Chupa Cabra II (driven by Polara Pat McInnis of Nelson, BC) and Frank Egli’s 1935 Chevy coupe (Salmon Arm, BC) launch hard from the starting line at WCRA drag race #1-Osoyoos, BC. There are those times in life. You know them, THOSE times. All you need is a little escape from reality. Whether your work is keeping your nose to the grindstone, flooding is getting you down, or your life needs a wee pick-me-up in general, there is someplace you can go. The volunteers of Wine Country Racing Association (WCRA) are getting Richter Pass Motorplex geared-up, out-fitted and ready to host the second race of the 2018 drag racing season in the South Okanagan Valley. The speed junkies from near and far will gather at the Osoyoos,BC airport on Sunday, June 3 to show off their hot cars. Let’s see what a little friendly competition can do to your average, everyday house wife or your neighbourhood mechanic when race day rolls around. Centered around good fun and great times, the drag racers are sure to put on a show to please the crowd all day long. Spectators can enjoy the scrumptious eats at the concession stand while watching side by side 1/8 mile drag racing from 11 a.m. with elimination rounds starting at 1 p.m.
Gates open at 9 a.m., but not only for spectators. If you’ve ever wondered what it’s like… If you’ve thought your car is fast… If you want to have some drag racing fun in the desert you are welcome to come race. New racers are encouraged to come early to register, pass their car through technical inspection and have a chance to chat and get to know the place. Get June started off on the right foot, with the right foot pressing the accelerator straight down, hard to the metal. Ten bucks gets you through the front gate. Remember, youngsters 12 and under are free, with an adult.